Rain water is naturally “soft” but when rain water falls on calcium, chalk, limestone or any other soft rock formation, it is the minerals within these rocks that dissolve into the water, giving you hard water around your home. 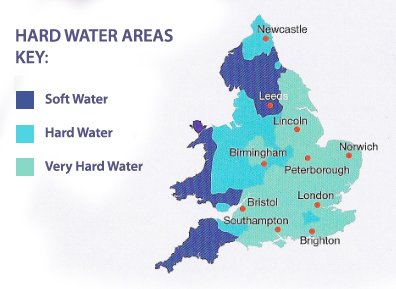 Over 60% of households in the UK suffer from the effects of hard water. Hard water scales up your hot water tanks, pipes, washing machines and heating systems. Government figures show that an amazing 38% loss in heating efficiency will occur with just 6mm of scale build up within an average family home heating system. 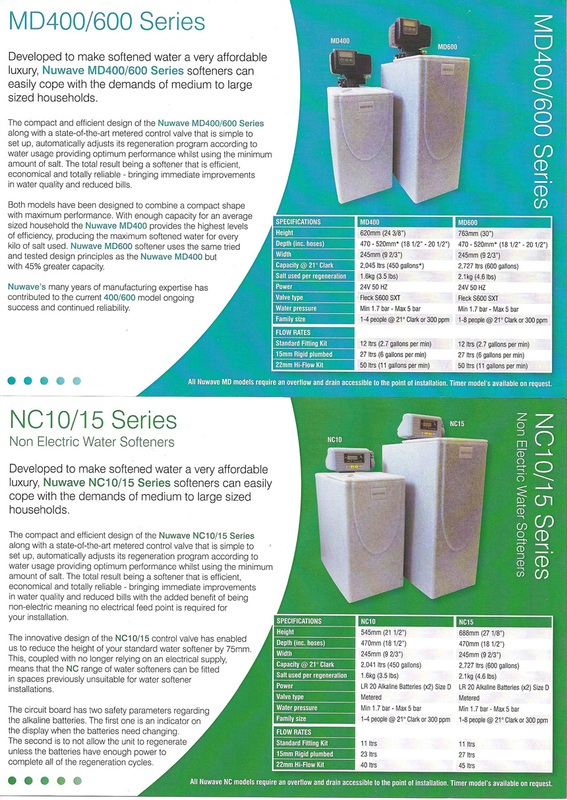 It is not too late to install a Nuwave water softener. Once you have, it will start to dissolve any existing scale and more importantly it will prevent any future scale build up! A water softener works by forcing hard water into a tank of millions of tiny beads of special resin. As the hard water passes over the beads a process known as ion exchange occurs and this causes the water to become soft. After a while (how long depends on the hardness of your water and the number of people in the house) the resin becomes exhausted and has to be regenerated. This is achieved by flushing the resin with salt water, a process known as regeneration. The salt water solution is washed away to drain and does not enter the household water supply. This approach is common to all water softeners but it’s how each manufacturer goes about it that separates the best from the merely average. 1.A basic unit which fits simply under the kitchen sink and comprises a single polypropylene filter housing and bracket, ancillary swan-neck tap, tubing and self-tapping saddle pipe connection. Installation requires the drilling of the work-surface top or sink-unit to accommodate the ancillary drinking water tap, the suspension of the filter by screwing the bracket to the side of the cabinet and connecting into the cold water by attaching the saddle, containing a selfpiercing valve, around the pipe. The housing contains a Granular Activated Carbon filter which will reduce harmful organic chemicals as well as taste, odour and chlorine. Scale can additionally be inhibited with an alternative carbon filter (TS-GAC), please specify. 2. The most popular, advanced and altogether complete multi-stage filtration unit, which is installed by the method described in No.1, The Ametek Heavy Metal Removal System incorporates a unique ‘Effective Life Indicator’ to monitor water usage and automatically shuts off the flow at 1500 gallons (the filter cartridges’ life) thus reminding you to change them. With a pressure regulator and flow controller enhancing the performance of the ultra fine particle filtration (0.5 micron) and a chemical/heavy metal reducing mixed media filter cartridge, the HM system is proven to be the best in its class. 3. Reverse Osmosis (RO), a true water purifier that separates the impurities from the pure water in a vessel and flushes the rest to waste. 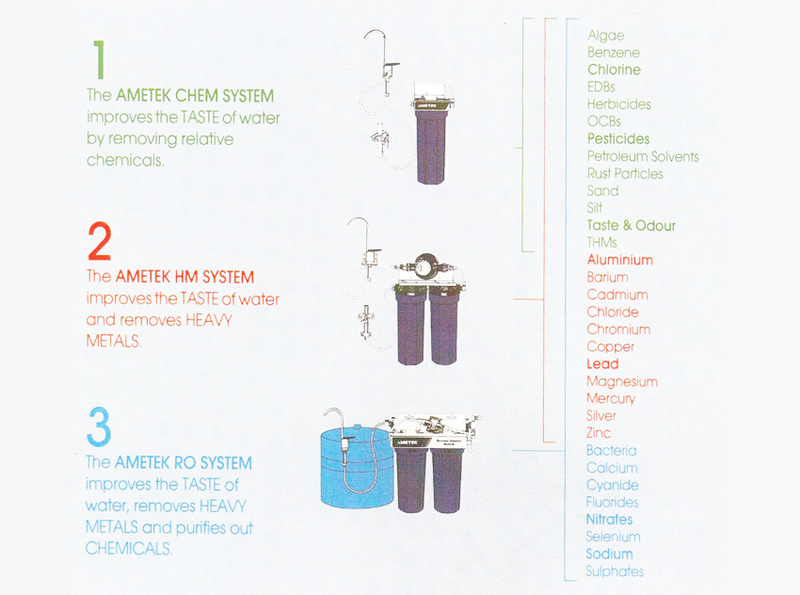 RO is universally considered to be the most effective method of removing impurities, including nitrates and sodium, with a similar performance on other contaminants as the Ametek HM System. It is installed similarly to the other systems but has, in addition, a pressurised tank for the on-tap storage of slowly produced purified water. A TDS Probe Meter or an Electronic Indicator fixed to the faucet tap can be supplied for continuous water quality monitoring as an addition. Whether or not to change the nature of your drinking water is entirely a matter of personal choice. 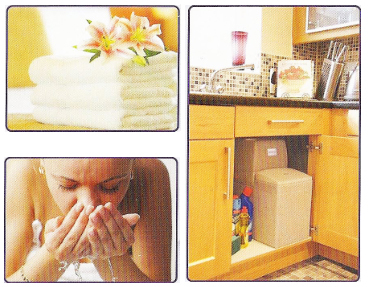 If you wish to do so, there’s a wide variety of products available designed to reduce and remove various substances. It’s important to check carefully that the product you select is capable of removing the substance you want removed. Jug filters are extremely popular and a relatively cheap way to improve the taste and appearance of water, which is the reason most people buy them, although they may prove more expensive than a plumbed-in filter in the long run as cartridges have to be replaced frequently. There is only one disadvantage they can only treat a small amount of water at a time. Any treated water not used immediately should be refrigerated. Alternatively, you can have the treatment plumbed-in, either as a single piece of equipment or as part of a ‘combination system’ using several different technologies. Using the same technique as a jug filter, these units dispense drinking water through a separate tap, on demand. Different combinations of filter material will provide different capabilities. Always follow the manufacturer’s recommendations on filter cartridge changes. These are so fine they can filter bacteria, giardia and cryptosporidia cysts as well as particles. They do need regular cleaning every 3-4 weeks (and must be handled carefully to prevent damage to the fine surface). A pre-filter can be used to overcome the problem of clogging. An RO system is an increasingly popular type of equipment consisting usually of filters, a membrane and a storage tank, and producing an exceptionally high quality of water. Consistently removing 95% of inorganic material, including heavy metals and 99% of larger organic material, it will also remove 99% of all bacteria together with giardia, cryptosporidia and the majority of viruses. Designed to prevent ‘bug’ contamination, UV disinfection will destroy bacteria, mould, algae and virus contamination. These units are often used on private well water and borehole supplies and usually in conjunction with sediment and activated carbon filters. Although a relatively expensive way to produce a high quality of drinking water, it is becoming increasingly popular, particularly in mobile homes, due to the portability of the units.